The process of weaving a basket starts right at the source, in the beauty of the BC forest. Bark is stripped from the north side of the trunk where there are fewer branches, which allows for smoother and longer pieces. Once the bark has been separated from the rough outer bark, it is cut into pieces, dyed if required, and bundled ready for use. Stored in cool dry conditions, weaving material can last for years before being used. Western Red Cedar grows along the coast of BC at lower elevations, while Yellow Cedar is found at higher elevations. The bark, branches and roots are strong and flexible, making the materials versatile and easy to work with. Weaving times vary, depending on the size of the material, the piece being made, and the difficulty of the pattern. 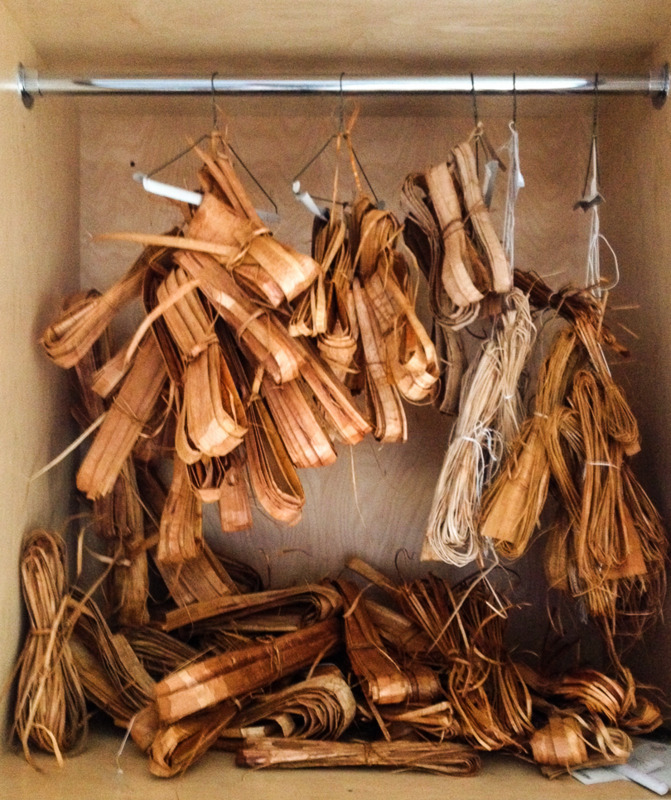 More than half the time used to make a woven piece goes into preparing the raw material. Cedar, once dampened, is responsive to bending and twisting, and must remain moist while being worked.